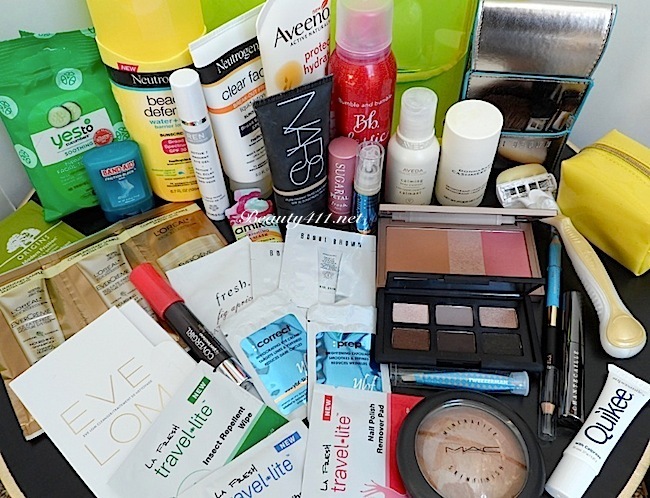 Do you conjure up all kinds of crazy images when you think of beauty bloggers hauling their makeup when they travel? The truth is, figuring out what makeup/skincare to take and then editing it down to a manageable amount is always stressful for me. See how I packed for my upcoming vacation in today’s Makeup Wars Challenge on Beauty Blogger Travel! The first rule that I travel by is that all makeup must fit into one travel bag. The line I’ve come to depend on for my travel bag needs is Stephanie Johnson. Stephanie truly gets it, because she’s a world-class traveler. For my upcoming Florida trip, I’m fitting everything into the Jumbo Zip Cosmetic bag in Miami Yellow ($46), from the new Spring Collection. This large case holds everything from my makeup to sun and skin care. Love! Now, for what’s in it…and thankfully, it’s not Fashion Week, so it’s manageable! Hair: I don’t like using “hotel” products of any kind, especially hair, so I save all the packette samples I get. This trip I’m bringing L’Oreal EverCreme Sulfate-Free Moisture System, Fekkai Shea Butter Moisturizing Shampoo and Conditioner, amika Nourishing Hair Mask and Bumble and bumble BB Classic Hairspray. Skin Care: I use good skin care whether I’m on vacation or not. For my upcoming vacation I’m taking Your Best Face (Ybf) Control, Correct and Prep; REN Active 7 Radiant Eye Gel, Eve Lom Cleanser, Bobbi Brown Gentle Cream Cleanser and Hydrating Face Cream, Origins Modern Friction. For Showering, I’m bringing Aveda Calming Body Cleanser and Fresh Fig Apricot Bath & Shower Gel. Deodorant is Donna Karen Cashmere Mist; thankfully Sephora sells the travel size. Sunscreen is a must everyday, but in Florida, I pile it on. I’m bringing a couple of new ones to test: Neutrogena beach defense Broad Spectrum SPF 30, which defends against signs of water damage, which is great, because I will be at the pool every chance I get. From AVEENO, there is new protect + hydrate lotion Broad Spectrum SPF 70, which is supposed to help nourish skin and reverse skin dehydration. For my face, I always use an oil-free formula, so I have Neutrogena Clear Face Broad Spectrum SPF 55. 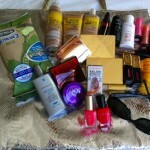 Miscellaneous necessities include, from LA Fresh, Insect Repellent Wipes, Makeup Remover Wipes and Antibacterial Wipes. I like the convenience of being able to toss these individual packettes in my purse. A Fashion Week staple–my Band-Aid Friction Block, which helps protect against blisters, Supersmile Quickee Tooth Whitener (lots of photos being taken! ), Venus + Olay Razor, which is moisturizing and conditioning, Say Yes to Cucumbers Makeup Remover Wipes (travel size), Tweezerman Mini Tweezers and my Pinch Provisions Mini Emergency Kit. If I forgot anything, I’ll find it in IN A PINCHTM . The best thing is that, as you can see in the photo, not only do all my toiletries fit in the Jumbo Zip Cosmetic bag, there’s plenty of room for last-minute additions. 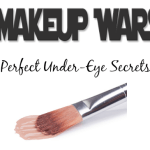 Thanks to this Makeup Wars, my vacation makeup bag is packed and read to go. How do you think I’ve done? 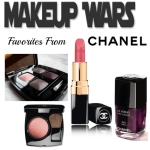 Let me know in the comments and be sure to check out the other Makeup Wars Challengers! 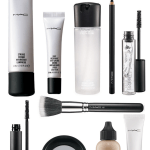 Disclosure: Press samples for some featured products have been provided by the brand/PR for editorial consideration, product testing and review. Holy cow that bag is AMAZING! I can’t believe how much it holds!!!!! Great choices Nancy! Naturally, we have a few of the same things. You have so many great travel items though – wow! Okay, I am going to have to hunt down that new Aveeno lotion! It gets stupid hot & dry down here in the summer with these 100+ temps, so I need all the moisture help I can get. @Brooke~This bag is seriously amazing! I love that I’ll have room to throw my phone adaptor in there, too! Wow! You were able to fit a lot in your bag!!! 🙂 Great selections!!! You are so much better than I am about packing small! What a great bag. I can’t believe how much it carries. I thought my bag held a lot but yours is pretty amazing. I like your cosmetic choices too. You are so much better than me. I bring everything! 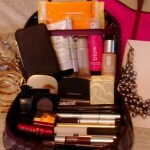 @Kelly I bring alot, but using packettes & sample sizes really helps! @Christine I put all my deluxe samples (from GWPs and subscription boxes!) into a large box and then dig thru when it’s time for vacation. It’s kind of fun! I use a lot of sample packets too. Great job! 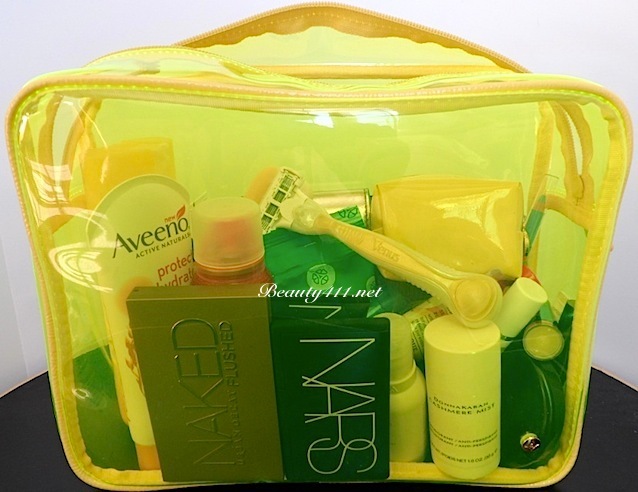 Your cosmetic bag does crazy magic tricks! It doesn’t look like it can hold THAT much. Woooow! Love the bag! I have some of the same sample packs in my bag! Yellow is my choice in the Miami too! Love to see how you travel and happy we are a part of it! Great post. I love the bright yellow bag! I’m amazed at what you can fit in there! Love the bag! I it carry-on approved?